Afghan Soldier in the Karakoram Mountains, Hindu Kush, 1901. John Roderick Demster Mackenzie. Oil on canvas, 46.00	x 61.00 cm. (18.11 x 24.02 inches). Signed and dated 1901. Courtesy of Sarah Colegrave Fine Art. Click on image to enlarge it. John Roderick Dempster MacKenzie was born in London in 1865. In 1872 his family moved to the USA, settling in Mobile, Alabama. His mother died in 1880 and the family was split up, he and a brother being placed in the care of Mobile’s Episcopal Church Home. Here his artistic interest was encouraged and he was provided with a scholarship to train at the School of the Museum of the Fine Arts in Boston, 1884-1886. In 1889 he went to Paris to study at the Academie Julian and later at l’École des Beaux-Arts. 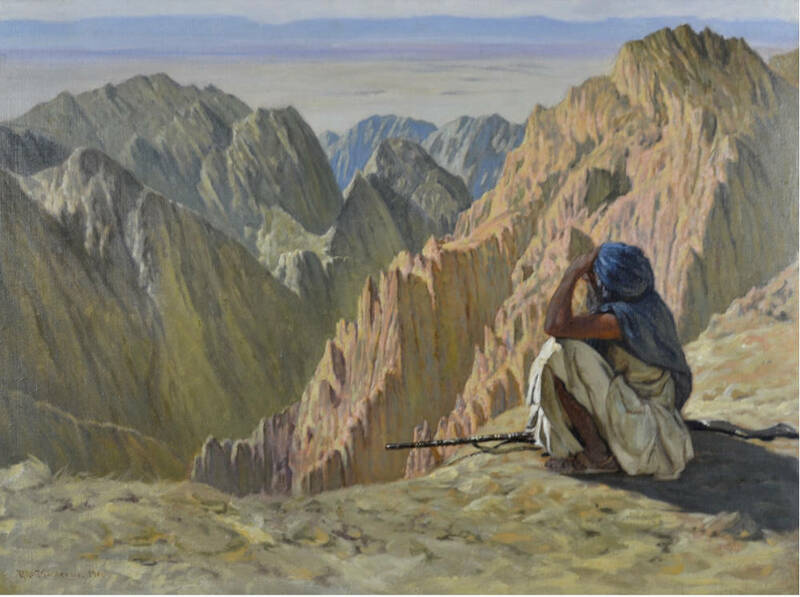 MacKenzie was then invited to visit India were he travelled to the Khyber Pass region, a visit which resulted in the present work and two of his most impressive large scale works: Baluchis and Our Restless Neighbors – The Afghans, which were exhibited at the Paris Salon in 1901. In 1902 he was commissioned by the English Viceroy to paint the official picture of The State Entry into Delhi (collection of Bristol Museum and Art Gallery) for the Durbar of 1903 which celebrated the proclamation of Edward VII as Emperor of India. He made numerous useful contacts with the British officials in India and received invitations from the Majarajah of Cooch Behar and the Nawab of Bahawalpur to accompany them on tiger hunts. MacKenzie returned to Europe and divided his time between London and Paris, painting and being a lecturer and writer on India and big game hunting. At the outbreak of World War I he returned to Alabama where he established himself as a portrait painter and ran an art school in Birmingham. In 1920 he became a member of the American Federation of the Arts and was appointed to the art commission of the state of Alabama. His later career was occupied with the execution of a number of major mural projects. He died in Mobile in 1941.